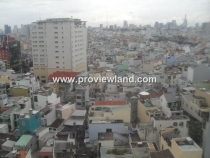 - Land area 3224.6 m2. - Total floor area (including basement) 31950.2 m2. - The total area of commercial services: 9732.7 m2. - The total area of 16215.8 m2 apartment. - Total number of units 125 units. - Built-up area 1819.8 m2 podium. - Tower block construction area 1250.5 m2. - Tower block building density 38%. Utilities: The additional area is located in the fifth floor with fitness room, living room, relaxation room, bar, … Especially in this position also has a swimming pool is designed according to modern standards. Groundbreaking architectural design, energy saving and friendly environment, each apartment is designed in harmony, reasonable interior layout, especially upon modern feng shui is the creative application to create Apartments are always welcome wind and natural light. The whole work is a harmonious whole to create a harmonious overall environment, a comfortable living environment, friendly and safe.